With smoke still rising from the wreckage of the 2015 election and the 2016 EU-referendum, the outlook for progressive politics is not at its most upbeat. It is in this context that Neal Lawson has written a chapter titled ‘Radical Hope’, for a new compendium of left and centre-left voices. 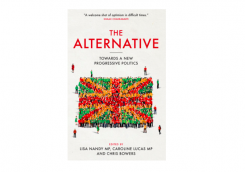 Neal is one of several commentators setting out new (optimistic) ways forward in The Alternative – Towards a New Progressive Politics, written by Lisa Nandy, Caroline Lucas and Chris Bowers, and published last week by BiteBack. One of the central arguments of The Alternative, is that, while the progressives have less leverage within the traditional party politics system, hope lies in the opportunity they have to concentrate on collaboration and cross-party cooperation for bringing about change. This, argue the authors, could serve to shift the ‘centre of power’ away from traditional party approaches, reinvigorating politics and building stronger coalitions with civil society. With crucial democratic pathways closed off, “the way to get your voice heard […] is not to engage but to disengage”, writes Zoe Williams in her chapter ‘Creating the Space for Change’. According to the introduction to the book: “those who want a good society can and must work together – and, by doing so, they can deliver better answers and more inclusive government”. “Progressives only have one real hope: that people can and should be trusted to run their lives and society the only way that is possible – by doing it together. The top-down 20th Century was defined by a politics that did things to people and for them. The networked society of the 21st century creates flatter planes on which real collaboration and open negotiation of the future is possible. These spaces will be contested by those who put greed and control before the common good – but the ways in which we can now connect, speak, listen, learn and organise makes a good society – one that can only be made by people – not just desirable but feasible”. The Alternative establishes a practical base of core values around which progressives can unite, and proposes a number of big policy ideas that embody these values. Speaking urgently to the situation in which progressives find themselves, The Alternative explores new forms of politics needed to fill the void. It draws on contributions from a number of commentators and political figures, including Siân Berry, Mhairi Black, Frances O’Grady, Tim Farron, Peter Hain, Carys Afoko, Yasmin Alibhai-Brown and Zoe Williams. The Alternative was compiled with support from the Joseph Rowntree Reform Trust. You can buy your copy here… and if you want Neal to sign it and/ or elaborate on the ideas inside, get in touch here.